This is a listing of the daily gifts from the Advent Calendar in 2018. If you are participating in the NC Mall event, we also have a list of the Stocking Stufftacular gifts. The bonus prizes also return this year. But instead of hidden Jinjahs, there are Angelpi! The Advent Calendar has given out 29,998 NP over 31 days this year! Hidden Bonus Item: Click the Angelpuss behind the books. Hidden Bonus Item: Click the Angelpuss below the tree's trunk. Hidden Bonus Item: Click the Angelpuss behind the Ixi. Hidden Bonus Item: Click the Angelpuss behind the pink box. Hidden Bonus Item: Click the Angelpuss beneath the window. Hidden Bonus Item: Click the Angelpuss behind the chair. Hidden Bonus Item: Click the Angelpuss to the left of the tree. Hidden Bonus Item: Click the Angelpuss in the trees. Hidden Bonus Item: Click the Angelpuss under the tree. Hidden Bonus Item: Click the Angelpuss on the rock. Hidden Bonus Item: Click the Angelpuss on the chair. Hidden Bonus Item: Click the Angelpuss at the base of the tree. Hidden Bonus Item: Click the Angelpuss behind the armrest. Hidden Bonus Item: Click the Angelpuss on the roof. 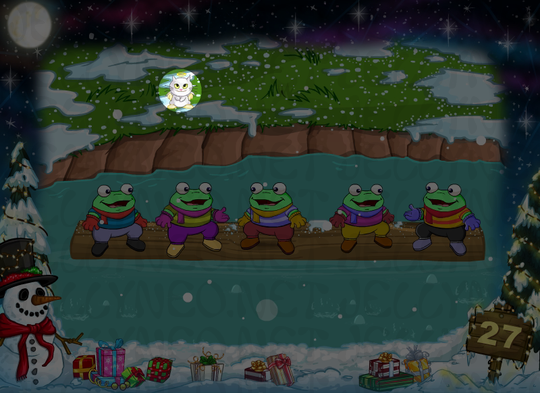 Hidden Bonus Item: Click the Angelpuss in the back of the rink. Hidden Bonus Item: Click the Angelpuss next to the guitars. 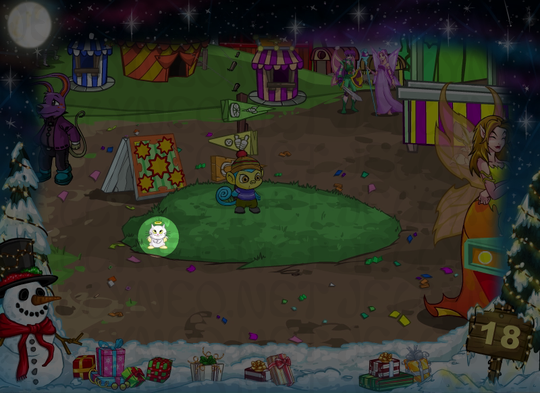 Hidden Bonus Item: Click the Angelpuss on the grass. Hidden Bonus Item: Click the Angelpuss on the counter. Hidden Bonus Item: Click the Angelpuss under the table. Hidden Bonus Item: Click the Angelpuss by the plants. Hidden Bonus Item: Click the Angelpuss behind Taelia. Hidden Bonus Item: Click the Angelpuss by the wall. 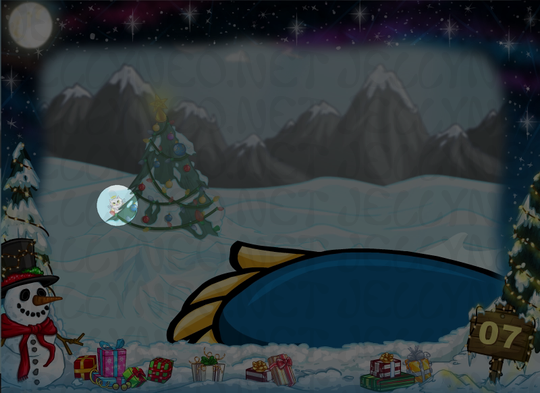 Hidden Bonus Item: Click the Angelpuss atop the gifts. Hidden Bonus Item: Click the Angelpuss atop the banister. Hidden Bonus Item: Click the Angelpuss on land. Hidden Bonus Item: Click the Angelpuss by the table. Hidden Bonus Item: Click the Angelpuss by the door. 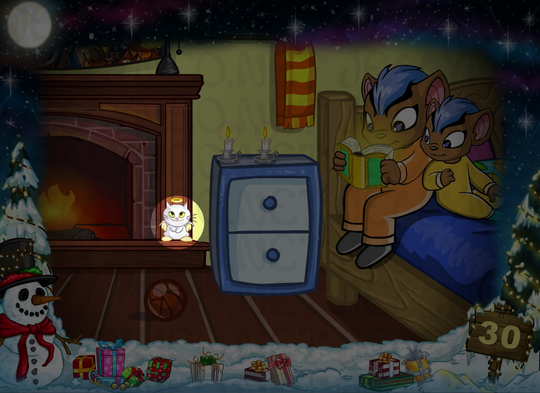 Hidden Bonus Item: Click the Angelpuss by the fireplace. 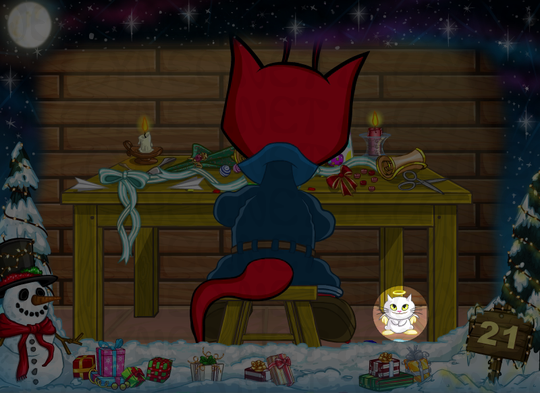 Hidden Bonus Item: Click the Angelpuss atop the table. 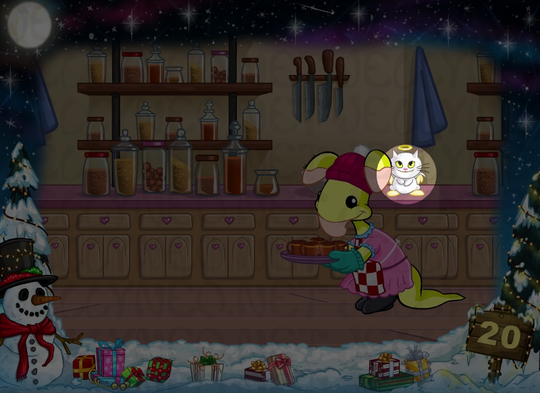 For the sixth year, each Advent animation has a clickable Angelpuss on each day. Clicking on these Angelpi will award you a random Neopoint item once per day. If you miss a day, just like the Advent itself, you may not go back to claim your missed prize.